I moved into my friend’s house today. 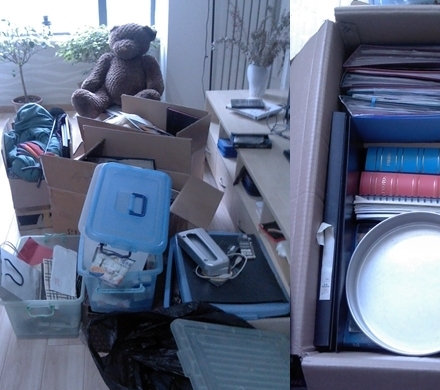 Tomorrow I move my long-term storage boxes to another friend’s house and take whatever hasn’t been claimed to Roundabout charity store. Thus begins my last two weeks in China. So surreal. Sitting in church yesterday it hit me – I only have two Sundays left here. I’m really leaving. It’s so different to the last big move I made. When I left Australia for China 10.5 years ago, I was so excited. I was off on an adventure – a long overdue adventure, as it seemed to me. In some ways it was like the kids I know here going off to college – an overseas move, a long way, leaving people behind – but the way it should be. I was leaving my parents’ house and my home church and going to university on another continent. I was striking out on my own for the first time. This time things are very, very different. This time I’m leaving a life I created for myself, a home I made for myself. Not only that, I am leaving with no guarantee that I will be back. I assume I will at least visit, but it’s not certain. Yep, this is a whole new experience! But there are similarities, too. After I started seriously considering leaving China to pursue further education, feelings I’d hidden from myself began to creep out of the woodwork. A sense that I was ready to move on to a new challenge. It took me quite a while to name what I was really feeling, and had been feeling for a while – bored. It felt like an awful, judging word – a word I couldn’t give voice to. I wasn’t bored of youth ministry or any of the people in my life (far from it!) but it was the boredom of a lack of new challenges. I think it says a lot about how much I love CCC, the working environment there, and the students and other leaders I’ve worked with that I stayed at it so long. I’ve been on staff at CCC for 4 years – by far the longest I’ve done anything consistently. But while I loved my work, I was no longer challenged by it. About 18 months after moving to China I became aware of just how much I’d grown in that time. I began to see how I’d hit a wall in my growth back in Australia – that I had needed to go somewhere different, do something different, to give me the challenge I needed to continue growing as a person. That’s exactly what I see in myself at the moment. It’s time to go somewhere new, do something new, to tackle new challenges – so I can continue to grow. I am all about growing as a person. I don’t want to stay the same. I don’t want to hit some comfort zone and just stay there. I want to keep becoming more, being better, learning how to be more myself and more at home in my own skin. Every year or two I look back and hardly recognise the woman I was before – and I love that. I wouldn’t go back to any point in my life before because the I wouldn’t be all I am now. As surreal and strange as it is to be leaving the world I know and love here, I know I want to continue to grow. I want to model that change and challenge to the students I work with. I want to be all I have the potential to be – which means being me in different places, doing different things. While I’m not excited about leaving China, I am excited about WHY I am leaving. I am excited to look back in a few years and see how I’ve grown through new experiences and new challenges.